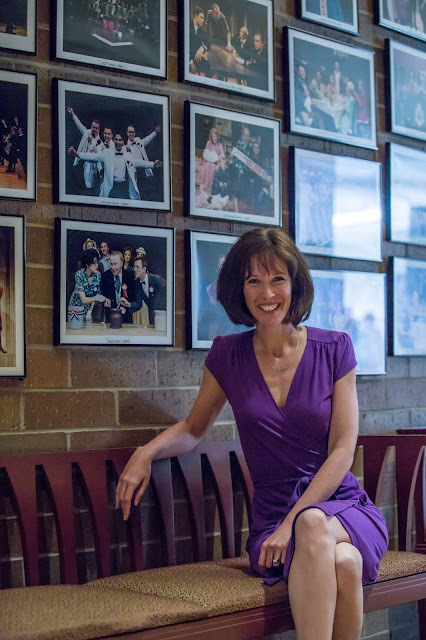 Linda Fortunato, Artistic Director of Theatre at the Center (TATC), Northwest Indiana’s only professional theater company, has announced the mainstage titles for TATC’s 2018 Season. Fortunato will direct three of the five productions, including Steel Magnolias, which will launch the 2018 season. Forever Plaid and The Lady with All the Answers are the spring and summer shows. In the fall, Fortunato will also direct Ghost The Musical, a stage adaptation of the 1990 Academy-Award winning film. Closing the 2018 season, she will direct and choreograph Meredith Willson’s Miracle on 34th Street: The Musical inspired by the 1947 classic film. Steel Magnolias (February 22 – March 25, 2018) is a hilarious and heart-warming play set in a Louisiana beauty shop. It follows the hopes, dreams, triumphs and tragedies of six colorful characters and inspired the 1989 film which starred Julia Roberts, Sally Field, Shirley MacLaine and Dolly Parton. It’s a story exploring the bond between a mother and daughter, and friendships of those who feel like family. Spring welcomes Forever Plaid (May 3 – June 3, 2018), one of the most popular and beloved of musical revues. “The Plaids” are a quirky quartet of high school chums in the spotlight for the biggest performance of their lives. Their spirited antics and comic banter weave together such hits as “Three Coins in the Fountain,” “Heart and Soul” and “Love is a Many Splendored Thing,” in this playful tribute to the close harmony of “guy groups” of the 1950’s. An up-close and personal introduction to the real Ann Landers awaits audiences in The Lady with All the Answers (July 12 – August 12, 2018). Popular advice columnist Ann Landers had a life which seemed letter-perfect. With more than 90 million readers each day, she had a quick wit which could be comical and creative, as well as sharp and shocking, all in the same sentence. The play unfolds in Landers’ Lakeshore Drive apartment in 1975 where she shares some of her most fascinating stories as she prepares to write the most difficult column of her career. The holidays are celebrated with Meredith Willson’s Miracle on 34th Street: The Musical (November 15 – December 23, 2018), from the composer of The Music Man. Inspired by the beloved 1947 film, audiences will enjoy the gift of music and laughter. After Santa encounters a skeptical little girl during the season of sharing and caring, a message about the importance of believing is made clear to all. “It’s Beginning to Look a Lot Like Christmas” became famous as one the memorable songs in this joyous favorite for all ages. “In choosing Theatre at the Center’s 2018 season, I wanted to create a blend of different styles to engage our audience,” Fortunato said. Founded in 1991, the 410 seat Theatre at the Center is a year-round professional theater at its home at The Center for Visual and Performing Arts, 1040 Ridge Road, Munster, Indiana. Theatre at the Center is the only professional theater company in Northwest Indiana, offering downtown caliber performance in an accessible venue with plenty of free parking. Theatre at the Center is located off I-80/94, just 35 minutes from downtown Chicago. Renewal for existing Season Subscriptions begins Aug. 20 and continues through Sept. 24, with sales for new Season Subscription patrons beginning Oct. 10. Individual tickets for any of the five mainstage shows of the new 2018 Season are on sale beginning Dec. 12. Theatre at the Center mainstage show performances are 2 p.m. Wednesdays and Thursdays, 7:30 p.m. Fridays, 3:00 and 7:30 p.m. Saturdays; 2:30 p.m. Sundays and select Thursday and Sunday evenings. Individual ticket prices range from $42 - $46. To purchase individual tickets, including the remaining shows of the 2017 Season, call the Box Office at 219-836-3255 or Tickets.com at 800-511-1552. Group discounts are available for groups of 11 or more and gift certificates are also available. For more information about Theatre at the Center, visit www.TheatreAtTheCenter.com.